Total Workshop search results: 17. Displaying Page 1 of your woodworking search phrase STEP STOOL CHILDRENS. Build a toddler bathroom step using these free woodworking plans. This is a link to a Google 3D SketchUp drawing for a very stable two-step step stool. You will need the SketchUp software to download this drawing and its freely available online. We do not provide support for this software. Not all drawings have the measurements displayed but you can use the measurement tool in SketchUp to easily and accurately determine the dimensions of each lumber part. Most drawings do not have instructions, its assumed you can build it based on the completed drawing provided. Build this child size step stool using these free instructions and scrap wood you may have on hand. Make your kids their very own stools! This DIY project is free and contains step by step instructions so you can build stools from wood boards! This is a link to a Google 3D SketchUp drawing for a child size folding step stool. You will need the SketchUp software to download this drawing and its freely available online. We do not provide support for this software. Not all drawings have the measurements displayed but you can use the measurement tool in SketchUp to easily and accurately determine the dimensions of each lumber part. Most drawings do not have instructions, its assumed you can build it based on the completed drawing provided. Build this step stool using these free instructions. Great for a child to reach the bathroom sink. This is a simple woodworking project that the whole family can help build. 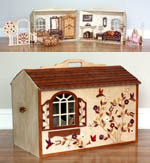 There are no written instructions but plenty of pictures to help you build this project. Build a step stool with these free easy-to-follow woodworking plans. This is a link to a Google 3D SketchUp drawing for a childs folding step stool and seat/chair. You will need the SketchUp software to download this drawing and its freely available online. We do not provide support for this software. Not all drawings have the measurements displayed but you can use the measurement tool in SketchUp to easily and accurately determine the dimensions of each lumber part. Most drawings do not have instructions, its assumed you can build it based on the completed drawing provided. You can easily make your own step save with a few common workshop tools and 52 inch length of 1 x 12 inch board ... and, best of all, says Gall, the handy stool can be constructed in less than an hour.